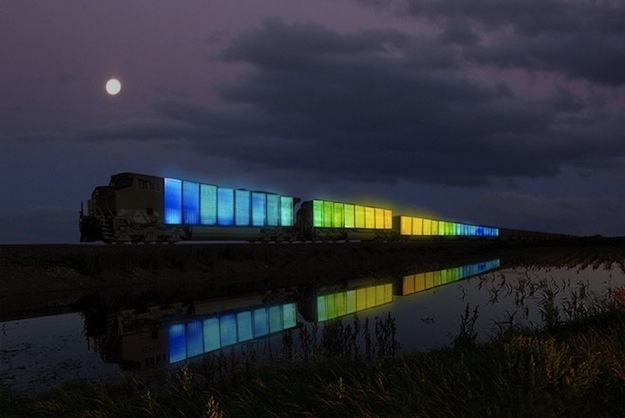 Artist Doug Aitken is gathering a group of artists and musicians and then sending them off cross-country for three weeks this September on an Amtrak train. "Station to Station: A Nomadic Happening." is a traveling expo will make ten stops in cities like Chicago, San Francisco and Los Angeles. In each they will stage unique cultural events connected to that town's own creative community. And it's very inclusive, ranging far beyond fine art into the realms of music, food, literature and film. The train itself will be decked out with programmable LEDs, creating a moving, kinetic sculpture that changes color and tempo as it goes.